The Camel spider is a spider type of insect that is not actually a spider yet it is part of Arachnida. 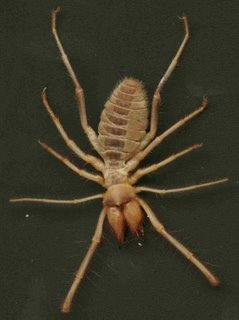 It is a member of the order Solifugae and is also known as a Wind scorpion, Sun scorpion, and Sun spider. Camel spiders live all over the world in countries like Egypt and Iraq. They are well known for being quite large in size and having a large jaw. Camel spiders are not harmful in that they are not venomous and the worst a bite from them could do is a minor infection. Camel spiders in the Desert will actually chase people so they can be covered by shade. Camel spiders are helpful because they eat many types of insects that are poisonous or harmful. Camel spiders have four sets of legs, yet they only use three sets. The front two legs of the Camel spider are used like antennae, and the six legs behind are used for movement. There is hair all over the body of a Camel spider, with most of that hair being on the head, abdomen and legs. Male and Female camel spiders differ in that male Camel spiders are smaller and have longer legs. The length of a Camel spider's body can be anywhere from five to six inches total in length. Camel spiders have a sticky set of Pedipalps that are used for catching their prey. The jaws of a Camel spider are very large and are used to crush prey. Camel spiders reproduce by the Male spider transferring its sperm to the female Camel spider. The male Camel spider puts a spermataphore that it produces on the ground, turns the female Camel spider over and puts it inside of it. Once the reproduction is over the female Camel spider makes a burrow where it will lay its eggs. The female Camel spider can lay anywhere from 50 to 200 eggs in the burrow. The female Camel spider eats a lot of food before the eggs are hatched so it will be able to feed them. When the eggs have hatched the babies are fed by their mother with food that the mother has stored up. After awhile the young Camel spiders leave the burrow and eventually help contribute even more to their species. Camel spiders can be found in most countries in the Middle East. Camel spiders prefer hot climates and a lot of them live in deserts. Some Camel spiders even live in forests and grassy areas. Although they prefer the hot climates most Camel spiders live in burrows or under plants they can find like bushes and such. There are some Camel spiders that are nocturnal due to the fact that they live in a very hot climate. Most of the Camel spiders found in the desert stay in any shady areas that they can find, even the shadows of people. Besides the warm climate Camel spiders that live in the desert also enjoy the sand because they can burrow in it if the heat gets too tense. The diet of a Camel spider consists of poisonous and harmful insects such as spiders, scorpions and even centipedes. Camel spiders have been said to run at speeds up to 30 MPH. They have been known falsely for screaming or screeching while they run. Camel spiders hunt humans, using a venom that numbs them and then they gnaw on their flesh while they are unaware or sleeping. Camel spiders can jump all the way up to three feet high. They are called Camel spiders because they have been known to eat the insides of Camels in the desert. Camel spider bites are venomous and deadly. Camel spiders can get as large as a frisbee in total body size. This page was last modified on 28 March 2009, at 21:55.